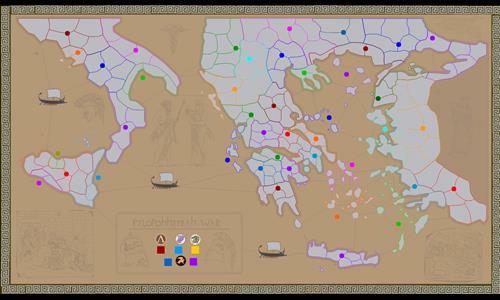 [13th Map] Based on an ancient war fought between the Greek City states of Athens and Sparta. An attempted 1v1 and team game strategy map. Review by Nathan on 9/2/2014. Splendid! This map is just nasty. There are no safe places, no havens from which to build up one's forces. It's just conquer or be conquered. The scenario is especially challenging. Very well done! First, the overseas connections are difficult to see as they are the same color as the background art. I recommend making them bolder/blacker. Next, some sea connections are not indicated by lines, particularly the connections to the Ionian Sea and the Tyrrhenian Sea. Also, what about a connection from Crete to Sicily? Sicily is the closest thing to a safe spot and another connection would cut down on that use of it. Thankyou for review as always and for pointing out connections. I tried to make the connection lines noticable but not too much to ruin the design. It's likely if more players suggest the Crete-Sicily link, I will change it. Review by Christian 'Thor' Picard on 9/3/2014. I especially like the gameplay surrounding all the islands: very few lock points and a lot of access to the surrounding land masses. You have to think thouroughly your invasion paths. Review by ҈ TeeMee123 ҈ on 5/26/2015. Review by no_light on 4/3/2017. Review by INSIDE on 6/7/2017. Review by ELLAS on 10/25/2014. Review by 𝔟𝔲𝔣𝔣𝔞𝔩𝔬 on 8/14/2016. Review by BasilBerylium on 9/4/2014. Review by Blackwolf111 on 9/21/2014. Review by elpibe1010 on 9/29/2014. Review by Coronel Gavilan on 2/28/2015. Review by Sinisa Ercegovac on 5/23/2015. Review by stjacky on 2/2/2016. Review by Trajan on 5/10/2016.